The Cubs won a hard fought 7 game series to win their first World Series Championship in 108 years, over the Cleveland Indians in 2016. 1) World Series Participants – These minifigures in their home pinstripes featured the World Series 2016 logo, and were available for a very limited time, from Game 1 of the World Series through to Game 6. At that point these were retired from production.All of these are sold out. 12/31/16. All of these are sold out. 3) World Series 10th Inning Collection – This unique boxed set was only made available for 10 days around Thanksgiving. It featured all that the Cubs fan needs to recreate the amazing 10th inning of Game 7 that allowed the Cubs to win. The set featured the Cubs in their royal blue jerseys that they wore that winning night. In this set, we also included the 2 Indians batters that were involved in the final play of the inning. This set was produced in just 580 units, and is retired, and sold out. 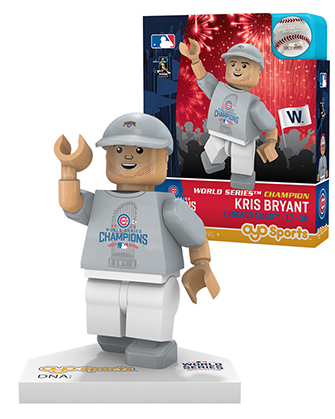 4) World Series Locker Room T-Shirt and Cap Collection – These special minifigures show off the best Cubs players on the team in the T-Shirt and Caps that the team wore to celebrate the momentous win in the locker room. These special packages showcased the players in a celebratory way, and were only produced from 1/15/17 until 4/15/17. The checklist attached will showcase all details of this historic collection. ← NFL Draft OYOs are gone, and here are the numbers!